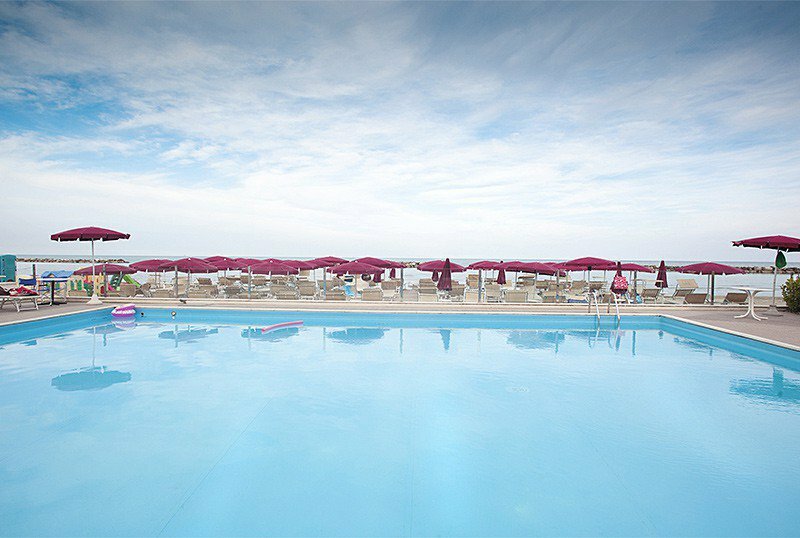 The Classic Hotel , 3 stars in Lido di Savio, is located on its own private beach, with direct access without roads to cross. It has a swimming pool, private parking, WI-FI throughout the entire hotel and services for children. Admits pets of all sizes with supplement. 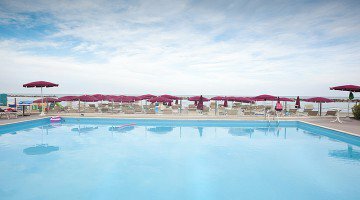 The hotel is located in Lido di Savio directly on the beach, to which it has direct access. The location is convenient for visiting Mirabilandia, the Po Delta Park and Ravenna. All rooms have a large balcony overlooking the sea, air conditioning, WI-FI, telephone, minibar, safe, TV, private bathroom with crystal shower and hairdryer. FAMILIES: Family Rooms are available consisting of two connecting rooms with two balconies and a bathroom. Swimming pool with sea water, private beach, large terrace, free bicycles, TV room, bar, lift, theme nights, beach towel. PARKING: uncovered, free and available to all guests. CONVENTIONS: beach, amusement parks, waterslide and law enforcement. PETS: all sizes accepted (for a fee). LUNCH AND DINNER: meals are served buffet style in the panoramic room overlooking the sea and offer 3-choice menus with the best traditional dishes of Romagna and a delicious dessert buffet. OTHER: theme nights and typical dinners are organized. In the hotel: outdoor playground area, entertainment, mini club, strollers. At meals: baby food , baby menu, high chairs, afternoon snack. The swimming pool is located on the hotel's private beach, 150 square meters wide and equipped with salt water and solarium area. The hotel has a private beach with direct access. - Long stay (min. 14 nights): 20% discount. - STOP Prices (min. 7 nights): if you book before the end of the stay, a week of vacation for the following year, will block the the current price list, you will be reserved a 20% discount for advance booking confirmed within 15 days with a 30% deposit. - Welcome back (min. 7 nights) for a further stay in the same season, 20% discount. - Special Seniors holidays (min. 7 nights): 25% discount reserved for senior couples (living in a double room with both occupants made 60 years). - Happy Couple Special (min. 7 nights): 20% discount reserved for all under 60 couples. - Mini Groups (min. 7 nights): for a minimum of 10 adults groups with full rate, 20% discount. - Refer a friend (min. 7 nights): Become our partner for a new reservation by friends, relatives and colleagues, you in your name, you will receive a discount of 25%. - Azzurro Club Vacanze Cheque of € 150,00 (min. 7 nights): to be discounted for stays of min. 2 people sharing a room. - PLATINUM CARD (minstay 3 nights): To all owners of the Platinum Card for all periods will be reserved for a discount of 25% and without obligation of deposit. In the event of a cancellation notice less than 24 hours of arrival, the customer will still be required to pay a contribution equal to 20% of the total confirmed. - BLUE CARD CLUB (minstay 6 nights): To all of Azzurro Club Card holders will be reserved for a discount of 20% in the period until 22.06. and from 08.09.2018 and 15% on all other periods. - New 2018 BOOKING BONUS OF 100% (minstay 7 nights): Booking a travel period between June 9 and September 8, 2018, you will receive a booking bonus of 100% transferable to friends and family, and valid for one person in a double room including May 1 and June 9, 2018 and september 8 to 15 in any structure Azzurro Club of the Coast. - OPEN BAR with Azzurro Club Vacanze Gift Card (minstay 6 nights): the periods indicated, includes a GIFT CARD with € 50,00 per room credit (with minimum 2 full-paying) used for all the drinks made at the bar of 'hotel. - CUSTOMER CLUB BLUE WEEK HOLIDAY 2018: booking a stay of at least six days before September 16, you will be entitled to participate for free in the sixth edition of the week of the customer Azzurro Club Vacanze which is held from 15 to 22 September 2018 at all facilities of Romagna.